Since 2002 the French Government created a public service to provide free internet access to legislature and law-related material. Legifrance is an initiative under the Prime Minister Office direct management and it provides the public at large with a wide collection of useful news and information about (mainly) the French legislature and related topics. The documentation service of the Secrétariat général du Gouvernement updates almost daily the juridical material provided in the website, e.g. the section Official Journal which aims at providing users and citizens with laws, decrees, etc. recently published and particularly relevant and daily updated. UE legislative production, European Court of Justice decisions as well as a selection of relevant international documents are also available. All records are retrievable in doc and rft format in their full-text version completely free of charge. Some pages in specific sections are retrievable also in English and Spanish but French is the main language. 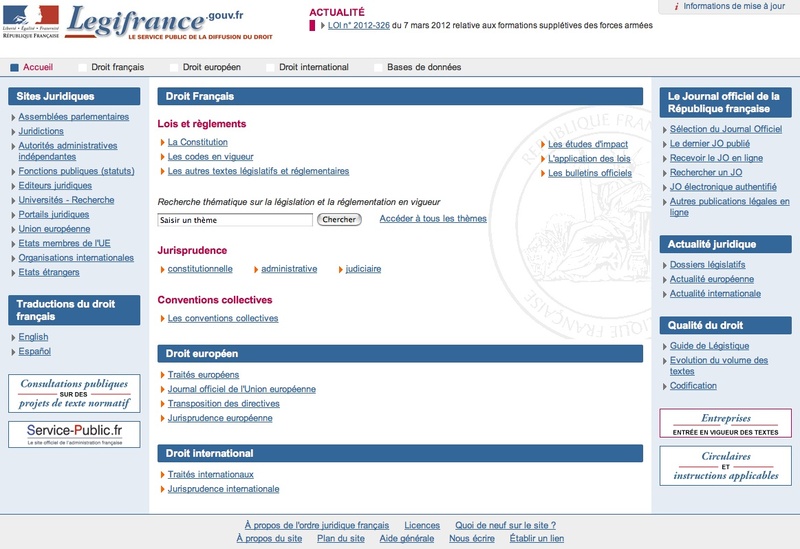 The Legifrance website is crearly structured although orientation is not easy at first sight. Users can search the website using a very advanced search engine.